What can I say about Walker other than how glad I am to have him as the newest member in our herd sire line-up! I had reserved a 1st and 2nd choice buckling out of two completely different BlissBerry breedings, and was all set to purchase one of those buck kids that had been born, but God had it set that Walker's breeding would be what our herd would get. 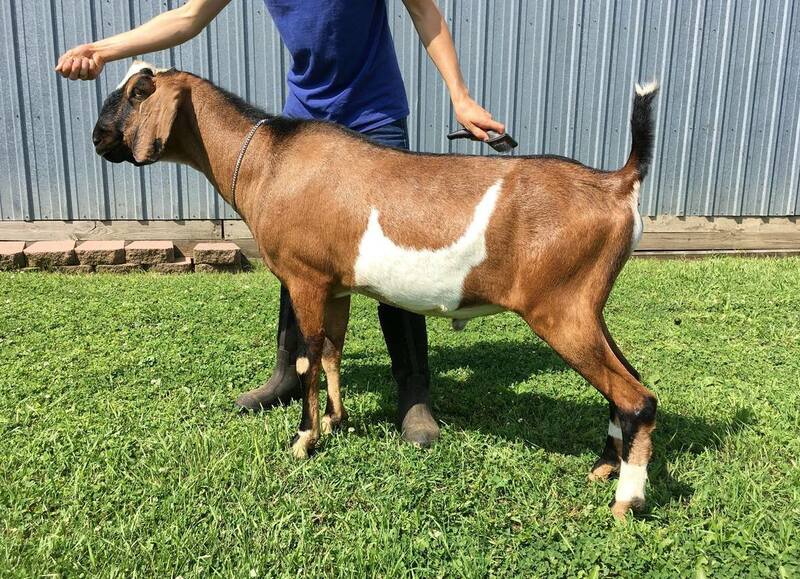 I have started to become very interested in the older Nubian genetics that formed what the big herds are today, and am so thrilled to have a herdsire out of an AI breeding that brings in those very lines. 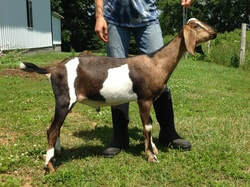 Almost Famous is littermate sister to Kastdemur's Breeze 4*M, who is the dam of Kastdemur's Sea Breeze 5*M. Almost Famous' dam, Aubree, is a STUNNING Nubian. She is the ideal paternal granddam of a herdsire. Not only was she the 2001 ADGA Nat'l Champion and Best Udder AND the 2002 ADGA Reserve Nat'l Champion and Best Udder, but she also is dam to SGCH Kastdemur's Audacity 4*M EX91, who is the dam to the highest ever appraising Nubian, SGCH Kastdemur's Temerity 5*M EX93 EEEE (also the 2008 ADGA Nat'l Champion & Best Udder and 2009 ADGA Nat'l Champion). Walker's dam Cali is beautiful and I expect nothing but good things will come of her as she continues to mature. I was able to meet her in person when picking up my BlissBerries and I loved what I saw of her. Her udder is beautifully correct, and her teats are ideal; long and slender. 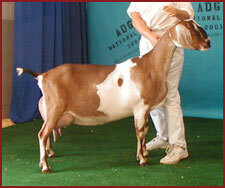 Her dam, Ruthie, also brings in older genetics and is a stunning doe with an incredible ability to produce milk! In her fifth lactation she produced over 4,100 lbs of milk! Walker himself is quite the looker. Much like is paternal half sister, GCH Blissberry Catch Me If You Can 4*M, he is so LONG and LEVEL. He exhibits a natural width in the escutcheon and great breed character. I love the consistency seen in the udders on both sides of his genetic tree and cannot wait to see his future kids! Update 2015: I have not gotten an update picture of him this year, but he has matured so much. I am excited about my retained daughter from him, Faith, and am anxious to freshen her in 2017! 2017: Walker sired triplets for Blissberry FD Popularity, two does and a buck! All kids were retained. With so many of his offspring making up my small herd, it was time for Walker to work in a different herd. He now resides in southwest MN.